If you like long walks on the beach this hike is for you! 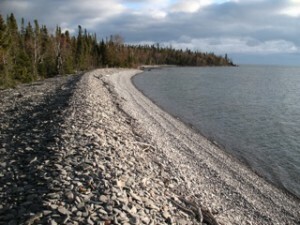 You will walk along pebble, sand, cobble and rock beaches — all with beautiful views of Lake Superior and several islands. We found it was nice to hike this in the fall as the waves were calm, and it was easier to stay dry. But this would also be a fantastic hike on a hot summer day when you don’t mind getting a bit wet. From the Pigeon River Border Crossing drive South on Highway 61 for 2km. Park off the highway close to a Grand Portage State Park sign located on the lake side of the highway. Near the sign look for a slope next to a culvert and hike down. At the bottom of the slope you will find a wide, flagged trail that leads to the lake. Once you reach the shore you hike along the beach as far as you like. There are some spots where you will have to bushwhack a short distance because the shoreline is impassable. At the 4km mark you will have reached an amazing terraced beach. You could continue past here if you wished but we found this to be a perfect spot to picnic and a good place to turn back.